EDMONTON, June 20, 2018 /CNW/ - Today, Fire & Flower, a corporate cannabis retailer, shared the designs for its future stores, which will launch across Canada upon cannabis legalization. Based on extensive market research, Fire & Flower's stores are intended to ensure customers across diverse demographics feel welcome, comfortable and are able to maintain a level of privacy should they so choose. Fire & Flower is focused on delivering a responsible, education-based approach to retail and extensive community engagement. The customer experience at Fire & Flower will focus both on education and knowledge of cannabis and cannabis-related products through highly-trained cannabis specialists in each location. 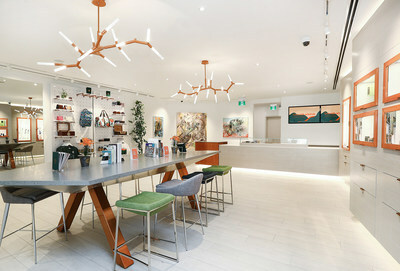 "Our store design is modern, bright and will ensure the highest level of comfort for our customers, many of whom are purchasing cannabis for the first time, upon legalization," shared Trevor Fencott, Fire & Flower's Chief Executive Officer. "As we work with landlords to establish retail locations, we are proud to share our best-in-class store design that will aim to elevate the retail experience in shopping centres and stand-alone retail stores." Responsible retailing for Fire & Flower encompasses many facets including: prohibiting consumption from minors, promoting road safety and offering stringently tested, first-class strains. Leveraging the latest technology and innovations, each retail location will include a robust proprietary security protocol to ensure the highest standards of safety for surrounding communities. This protocol was developed with the assistance of Norman Inkster, a Fire & Flower board member, who served as the 18th Commissioner of the Royal Canadian Mounted Police and President of Interpol for two years. The interior design concept was created by internationally renowned interior designer, Johnson Chou. Johnson worked with Fire & Flower's retail experience team and Edmonton-based international architecture and engineering firm, Stantec, who will implement the concept in markets across Canada. The stores will be constructed by Fire & Flower's construction partner, Clark Builders. Founded by leading legal cannabis entrepreneurs, Fire & Flower's leadership team carries extensive experience in launching successful businesses and 20 years in the legal cannabis space. The company is versed in the national legalization of cannabis and is actively influencing the evolution of the new cannabis industry across the country.